You are invited to a once-in-a-lifetime chance to earn the Graphic Arts merit badge using the almost 600-year-old letterpress printing process. With minimal advanced preparation, Scouts will be able to leave at the end of the night with the merit badge completed. The workshops are held in The Steinman Center Graphic Communications and Printing Technology Lab located in the Thaddeus Stevens College of Technology on Orange, 60 Parkside Avenue, Lancaster, PA. Everything a Scout needs to know to complete the requirements for this merit badge is in the merit badge pamphlet. This workshop fills up fast so register as soon as possible by contacting Ken Kulakowsky to check for availability. 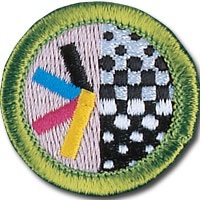 The workshop costs $15 which covers all materials necessary to complete the badge, including a t-shirt and postage for the return of your printed project & merit badge card. The workshop is sponsored by members of The .918 Club of the Heritage Press Museum and Thaddeus Stevens College of Technology’s Graphic Communications Technology Department.